Under the 1931 transport regulations a coach company had to get a licence for trips other than its normal route services – which were termed ‘specials’. 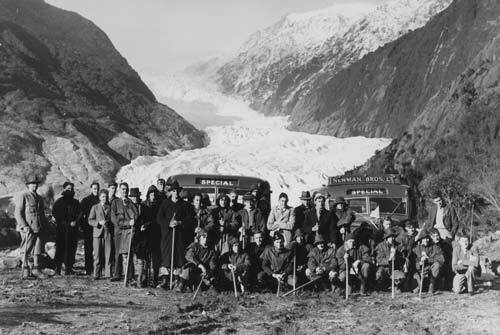 These two Newman Brothers coaches, clearly marked ‘Special’, have taken a group to the foot of Franz Josef Glacier, probably in the late 1930s. Specials took people to sports games, the races, A & P shows, parties and other events. Special licences came to an end with the Transport Amendment (No. 2) Act 1983. The new system licensed vehicles rather than services. Permission of the Macmillan Brown Library, University of Canterbury, must be obtained before any re-use of this image.